There are 3 sleeve length options in the pattern and you can easily change the body length, too. I really wanted to show you some of these variations on the Rosalia theme, but after knitting my original, my arthritic hands weren’t quite as thrilled with the encore idea. 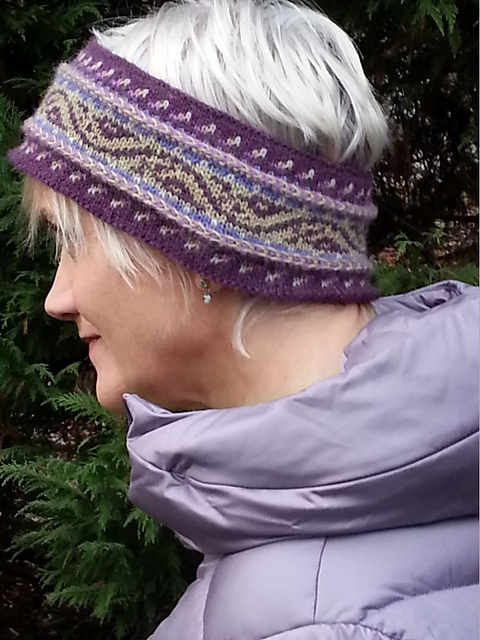 Enter Debra Thayer, the most wonderful test knitter I could ever ask for. Debbie knit “Rosalia Encore” for me in Heilo, using charcoal grey for the background, mist for the motif, grey heather for the zigzag, and light steel blue (which I always think of as “sea green”) and petrol for the accents. She used the full-length sleeves with only 1 shoulder stripe and she added 1 extra repeat in the length. She used the middle size (as I did for my original) and, interestingly, she told me her variations upon the middle size ended up taking exactly the same amount of yarn as is called for in the largest size. 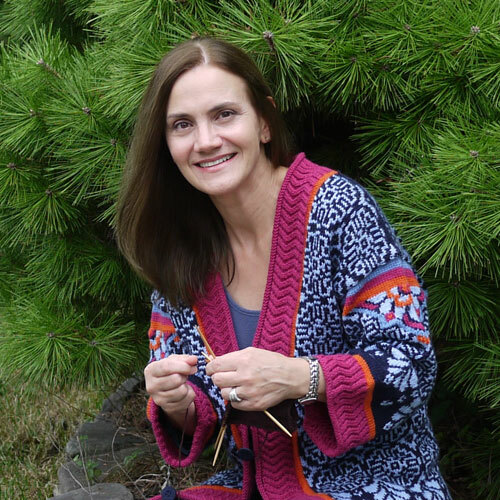 This entry was posted in Blogroll, Knitting, Mary Ann's Designs, On Twist Collective, Uncategorized and tagged cardigan, Dale of Norway, fair isle, falk, Heilo, kimono, knit, Knitting, Mary Ann Stephens, norwegian, Rosalia, stranded, sweater, twist collective, winter 2010, yarn. Bookmark the permalink. That is absolutely beautiful! You really should get the second version posted on Ravelry! For me, the more neutral one caught my eye much more than the original. I’m sure it’s just the opposite for others. Variety is the spice of life! WOW. Mary Ann, I liked the original Rosalia, but I have to say that I LOVE the graphic quality and contrast in this version! It is fantastic. How in the world did you manage to knit two! Yikes! Debra Thayer, a most magnificent test knitter, knit the second one for me. I could never have managed to knit two of them in the space of just two months. I’m a slow knitter, so the only way I was able to get the original done over the summer was to drag it everywhere with me. And I do mean EVERYWHERE! Fortunately, with my 3 boys, life presents many opportunities for turning lemons into lemonade or, better yet, knitting opportunities: daily backyard lifeguarding sessions (always from a strategic, splash-free distance – priorities, you know?! 😉 ), New England Patriots training camp, New York Jets training camp, kids’ sports training camps…Perhaps not what we’d picture as the ideal knitting settings, but they did the trick. I knew from the beginning that I wanted some variations on the theme. One of the things that surely delays the development of many of my projects is that I’m forever playing around with various colorways. I designed it in several different colorways, but Kate liked the idea of the shorter sleeves, the brighter blue-jean-friendly colors, and the softer Falk, so that determined which one was knit first. Perhaps it’s the typical grey-to-black clad New Yorker in me, or the fact that I’m just an old-school, plain-old-wool-please fuddy-duddy, but I couldn’t let the idea of a neutral one go. Thankfully, Debbie was there to help out. Wow! I wasn’t taken with the original color scheme, but certainly appreciated the pattern. Then along comes the sweater in neutrals, and I.am.in.LOVE. It’s gorgeous! Well done. I made your amarylis mittens a few years ago for my daughter. She adores them. I was browsing and saw the longer version of your Rosalie sweater. It is gorgeous. Both colorways demonstrate what an OUTSTANDING design it is. Bravo!